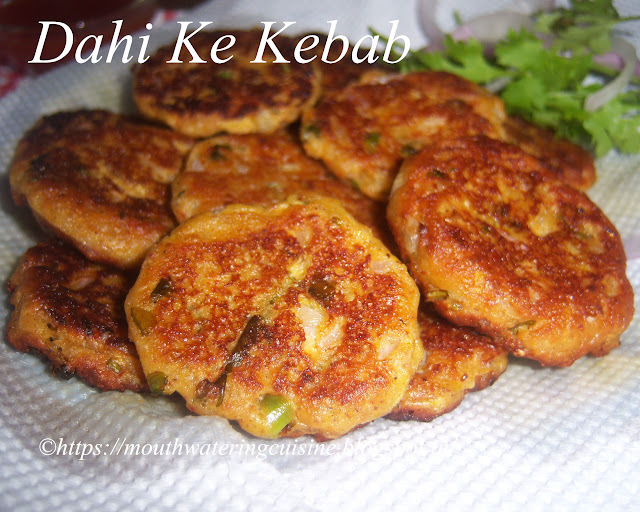 The Dahi Ke Kebab is a very simple and easy snack item made with hung curd. It is the best appetizer to start parties. I have picked it from Sanjeev Kapoor. Take yogurt or curd in a kitchen towel or muslin cloth and hang it for two hours. Chop onions, green chillies, ginger and coriander. Combine chopped onions, chillies, ginger and coriander leaves to hung curd and mix well. Then add salt, turmeric powder, red chilli powder, garam masala, and kasuri methi to it and again mix well. Add all purpose flour also to it and make small lemon sized ball. If it is not forming easily add some more flour to it. Take lemon sized ball, press it in between palms and make small patties or tikkies or kebabs. Heat little oil in a kadai, fry the kebabs on low flame. Add one teaspoon oil to it and cook till they turn into brown colour. Flip and add oil and cook for one more minute. Serve dahi ke kebabs with sauce or green chutney.